This week I finished the rewrites to my sequel to SOMEONE HAS TO DIE. In this new thriller, ISIS attacks Indonesia, and one of the heroes from the first novel, the ex-terrorist Abdullah, accepts the challenge to take down the ISIS cell—non-violently. The working title for this book is A WAY OUT OF HELL, and I hope to have it published by this summer. Watch this site! My writing couldn’t have been more prescient. Last week a group claiming affiliation with ISIS launched an attack on central Jakarta, using guns, grenades and bombs, starting with a suicide bombing in a Starbucks and ending with a gun battle in the streets. At least seven were killed, including all five attackers. This attack mirrors exactly the modus operandi I present in my book. In the Middle East, ISIS is focused on territory. To have a world-leader caliph, he must have territory to govern. But in Paris, Jakarta, and perhaps other cities around the world, ISIS-sympathetic groups can’t realistically be looking to take over territory—so what are they up to? Such groups believe that producing chaos and fear can lead to destabilized governments, opening the door for dramatic governmental shifts that can be used to their advantage. Indonesia is a prime target for such an approach. For years there have been several organizations and even political parties promoting an Islamic government, though the general populace supports pluralism. But with a traditionally weak central government, were enough instability and fear to rock the country, people might turn to a strong leader from the Muslim radicals who could negotiate an end to the conflict by giving in to demands for a stricter application of Syariah Law (such as has already happened in the province of Aceh). This in turn could pave the way for the nation’s leaders to pledge allegiance to the caliph. Stopping ISIS in the Middle East is extremely complicated; but stopping ISIS from destabilizing nations with strong pluralistic majorities is less complicated and very possible. As I mentioned in my last post, I disagree with the president of France’s “merciless” approach. If we put all suspected terrorists in jail, what happens? 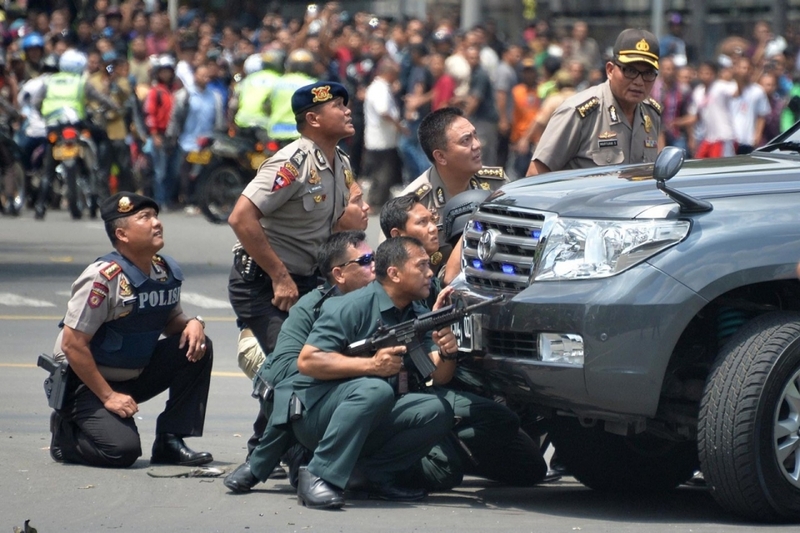 At least one report from Jakarta stated that all five attackers had spent time in jail. Prison is the #1 recruiting post for new radicals or “rededicated” radicals. And for each “martyr” killed in jihad, ten more are inspired to rise up in their place. There is a better way, a non-violent way to stop the cycle of violence and death. Keep reading this blog and I’ll explain more in the weeks to come. I welcome your comments on how to deal with ISIS as well. Let’s continually pray for peace.